Mmmmmmmmmmmmmm..........sometimes savory can be so much better than sweet. 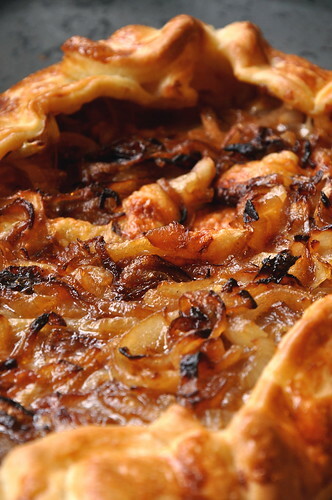 Just imagine it- melty cheese, golden onions, and flaky pastry. Tell me you aren't drooling. 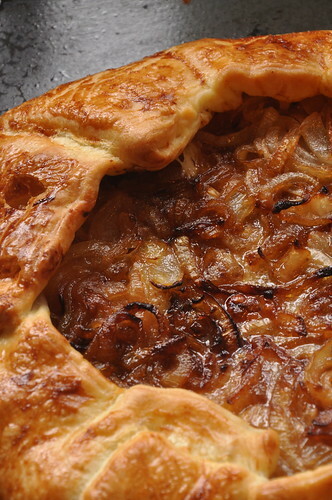 Caramelized onion tart is one of my favorite things to make for dinner parties. I can't remember if I've told you or not, but every week I host Sunday Supper. Each sunday, a big group of my friends and I gather together, lately out in the grassy courtyard outside of my dorm, and eat. I can't think of anything I'd rather do than eat a delicious meal with all of my friends in the sun. There are some regular attendees, but I'm nearly always surprised by a new guest star every week. I try to mix things up, bringing out new recipes, not returning to a fall-back meal in order to avoid boring those who come again and again. I've roasted chickens with sauteed zucchini and onions stuffed under the skins, and I've roasted them smothered in an Indian spiced yogurt sauce. I made my family's prize-winning chili and my favorite spaghetti bolognese. I whipped up a tomato and mozzarella couscous in a nod to the lovely spring weather. I even made a chicken and lemongrass stir-fry. Though I try to diversify my cooking, one dish has made the rounds a few times. One special meal has made it into the Sunday Supper hall of fame. You guessed it. 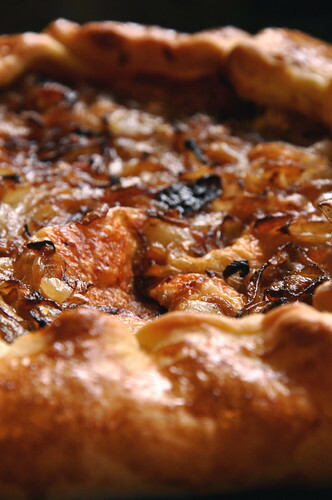 The caramelized onion tart! It is unbelievably simple to make. I almost feel embarrassed sharing the recipe with you to be honest. The nice thing is that you will likely have every single ingredient on hand. 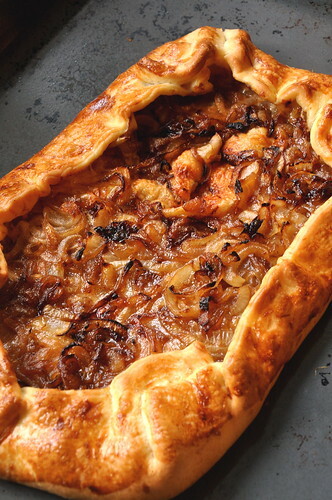 If you're feeling adventurous you can easily make your own crust, but, to be honest, people never notice the difference, so a good store-bought short crust pastry works equally well. If you feel super indulgent, you could even have some for breakfast. It's ok....I won't tell anyone. The flavor is rich and addictive. 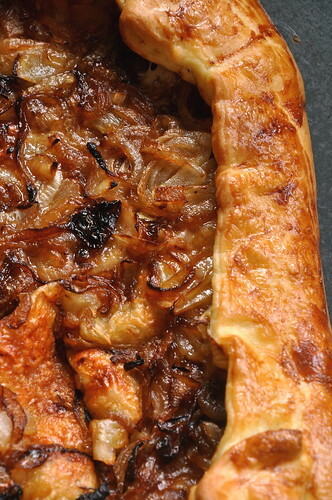 The salty cheese meets the sweet onions in a delightfully unctuous way, balancing the delicate crumble of the crust, all working together to make the perfect star of your next meal. Preheat the oven as directed on the pastry package. Roll out the pastry on a lightly greased baking sheet. Heat the butter in a skillet on medium heat. Add the sliced onions and cook on low heat until they are fragrant, soft, and a deep honey color. 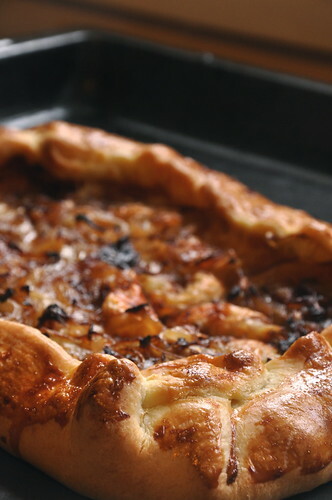 Sprinkle the Grano Padano cheese over top of the pastry, leaving a 1 inch border . Sprinkle the Gruyere on top. Scatter the onions over the cheese. Fold the edges over the onions. Whisk together the egg yolk and the water. Brush exposed pastry with egg mixture. Bake as directed on the pastry package. very nice job hayley !! i have been making galtetts, but had not thought of the grills onions. I haven't had lunch yet and this looks so good right now, I'm tempted to lick the screen. Delicious! thank you girls! if you're ever in scotland, come by for a slice! Will give this a go. All your recipes look very interesting. Shall try to work my way through some of them. From one cook to another. Well done Hayley! Is there any other kinds of cheese I can use?